Accusations of bribery from the gaming community popped up in regards to reviews doled out by various Italian and Spanish gaming websites, most notably writers at IGN Italy and Multiplayer.it. The bribery accusations came to a head after a report from Pretend Cars was published back in September of 2016 claiming that the scores for the console version of Assetto Corsa were inflated by various publications located in Italy and Spain. The article questioned how could the game get such high scores when it was riddled with so many bugs at launch? These kind of claims are usually countered with skepticism about conspiracy theories… that is just until you look at the Metacritic scores for the game and realize there really is a gulf between what some of the scores for Assetto Corsa. For instance, the PS4 user aggregate on Metacritic is 6.1 out of 10 (or 61 out of 100) where-as the professional critic score is 73 out of 100. Why the 12 point difference? Well, Pretend Cars points to several outlets with exceptionally high review scores, such as IGN Italy, a Finnish magazine called Pelit, Digitally Downloaded, and Multiplayer.it (amongst others) who all gave the game 90+ scores. 18 of the reviews are positive, majority of which are from Spain and Italy, one of the reviews (from Destructoid) is negative and 16 of the reviews are average. Some people claimed that Assetto Corsa on console should not have received such high scores for a number of different reasons. What’s more is that some of these criticisms aimed at game reviewers deals with objective performance issues and not just subjective reasoning based on enjoyment or aesthetics. That was what was originally written by Antonelli when the article was first published on August 25th, 2016. However, after complaints from readers and accusations of bribery took hold of the discussion, IGN went back and amended the piece to scratch out the 60fps line and note that some users encountered frame-rate issues. There was such a huge blow back from readers that an IGN moderator had to sticky a lengthy post stating that they had never encountered any screen-tearing or frame-rate issues when playing Assetto Corsa on PS4 after “extensive” testing, but they apologized for not originally addressing the concerns of readers. IGN’s claim directly contradicts the technical analysis provided by Digital Foundry, who did a four minute video breakdown on how both the PS4 and Xbox One version Assetto Corsa suffered from constant stutter when more than 10 cars were on the track, and they had infrequent frame-tearing. It wasn’t just Digital Foundry who ran into this problem, though. Other gamers also had issues with the frame-rate. We were linked to another video from an average gamer, Stephen Calvert, playing the console version of Assetto Corsa shortly after launch where the game suffered from some serious frame stutter. You can see the footage for yourself below. Now some reviews glossed over the performance issues even though they didn’t give the game the highest of scores. I figured I would ask them how serious the performance issues actually were and if they did play a role in the overall scoring of the game. The question then becomes: how did something like this go unnoticed by reviewers enough to warrant a 90 or 95 out of 100 when even the developers acknowledged it was an issue? Nevertheless, Pretend Cars did a follow-up piece on December 30th, 2016, pointing out that Kunos did hire Instagram models to promote the game on social media, and they also sent out swag kits for content creators. Kunos also held special live racetrack events in Italy, inviting certain members of the press to check out Assetto Corsa and see some real life cars racing on the track ahead of the reviews being published on sites like IGN. 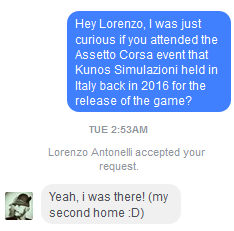 For instance, Lorenzo Antonelli, who wrote the IGN Italy review, did attend the special media invite from Kunos for Assetto Corsa. Multiplayer.it, who also gave the game a glowing score, had its reviewer, Andrea Centini, also attend the event. The invite to the press event went undisclosed in the Italian reviews for Assetto Corsa. Even though the reviewers attended the media event, they didn’t mention it to their audience in the reviews. Of course, not every member of the press who gave the game glowing scores was invited. Jaz Rignall from US Gamer was left out of the event. @WilliamUsherGB No. Unfortunately not. Sounded like a lot of fun! US Gamer still scored Assetto Corsa a 90 out of 100, according to Metacritic. Digitally Downloaded also gave the game a glowing review as well. However, the writer was not invited to the press event. In fact, none of the game reviewers in North America were invited, according to Kunos Simulazioni’s Stefano Casillo. So there’s really no explanation for the high scores on the North American side other than that they may have really liked the game. Actual evidence of bribery – with an exchange of money – has not been proven. However, for the Spanish and Italian game reviewers, a lot of gamers felt as if their scores had been inflated due to the swag, the freebies and the special press events held before the reviews were published. Some people likened the press events to the review parties that are held for some games where press are invited to a party to review a game under supervision from the studio. Regardless of the accusations, the journalists who reviewed the game – after receiving the swag and going to the events – should have made disclosures in their reviews to give the readers a heads-up and inform them about these situations to avoid the appearance of a conflict of interest.